With a corporate portfolio as large as GM's, there are options. Remember the Chevrolet Orlando? That crossover was supposed to come to the U.S. before GM decided it might cannibalize sales of the mid-size Equinox, so it shuffled the Orlando off to Canada instead. The Trax, on the other hand, was not supposed to come here; then the brand decided that, well, perhaps it should. Launched in Mexico two years ago and in Canada last year, it will join the brand's lineup of "youth-focused vehicles," which also includes the Spark and the Sonic. Built atop the Gamma SUV platform shared with the Opel Mokka and the Buick Encore, the Trax is short (168.5 inches), of average width (69.9 inches), but really tall (65.9 inches). These dimensions make for generous interior space and cargo volume, given the small footprint. They also underscore that space utilization, and not a low center of gravity or, we suspect, vehicle dynamics in general, was a top priority in the development of this vehicle. That is no surprise, given the competitive set of the Trax. Chevrolet has positioned it against the Kia Soul, the Nissan Juke, and, somewhat oddly, the Mitsubishi Outlander Sport. And there will be even more action in the compact crossover segment with Jeep’s new Renegade on the way for a 2015 arrival. This segment is about versatility, affordability, and a certain style. Connectivity? The Trax has it: 4G LTE service, USB ports, Chevy's MyLink with a large touch screen, Siri Eyes Free capability, and a Wi-Fi hot spot are offered. Convenience? There is a standard backup camera, storage areas abound, and a remote keyless-entry system is part of the package as well. Safety? The Trax has more standard air bags than its competitors, according to Chevrolet. That’s a statement that's going to give customers peace of mind, even though it says little about a vehicle's comprehensive crash performance. The Trax will be offered in three trim levels, wearing Chevy's trademark LS, LT, and LTZ monikers. The differences are mostly cosmetic; the LS is fitted with 16-inch steel wheels, the LT upgrades to 16-inch aluminum wheels, and the LTZ comes with less-diminutive 18-inchers. Inside, visible differences include the seat materials and trim on the dash and doors. All versions look pleasant, but none are capable of arousing particular excitement. Compared to the Juke and Soul, the Trax is easily the most conservatively styled entry. Power comes from GM's proven 1.4-liter turbo four, a smooth and responsive unit that has to cope with at least 2800 pounds of vehicle to move around in the lightest, front-drive examples. And mass rises to more than 3200 pounds when the optional all-wheel-drive system is specified. With front-wheel drive, Chevy claims the Trax reaches 60 mph in 9.1 seconds; fuel economy is an EPA-rated 26 city/34 highway for the front-wheel-drive model. The only available transmission is a six-speed automatic. 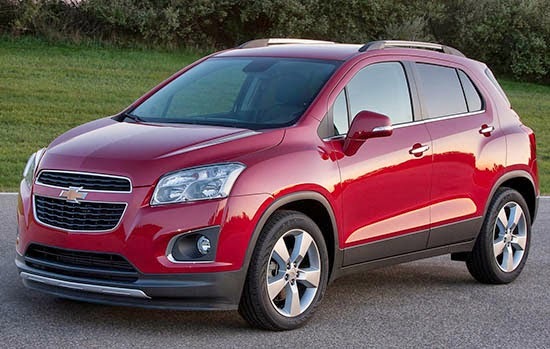 The Trax launches in the U.S. at the end of 2014. Pricing will be announced closer to that date, and we expect it to come in below $20,000. That’s significantly less than the 2014 Buick Encore’s price, which starts at $25,085. Look for driving impressions soon.